Learn how to build better online relationships with prospects through research, patience, and a focus on adding value. The best salespeople build strong relationships with their prospects time and time again. It’s a process that requires research, social skills, and regular interaction, which is why it translates so well to the world of social media. Sometimes, these business relationships may blossom into long-term partnerships and even friendships. However, though warmth matters, reps who include too much personal information in their messaging risk crossing a line, alienating prospects and ultimately being ignored. Here, we’ll teach you how to reach out to prospects effectively with the right research, a patient mindset, and a laser focus on adding value. In order to understand your prospect’s pain points enough to offer them something valuable, you’ll need to do some research. Most of this can be conducted online, and though social media outlets like LinkedIn should factor in, they should never be the end-all-be-all of your research. You should always visit the company’s own site first, then scour the web for any articles, press releases, or other relevant recent news about their industry. While research is critical, it’s possible to over-do it. For example, Hubspot advises that seasoned social sellers can spend as little as five minutes on preliminary research. Most importantly, remember that your research should be guided by a desire to uncover pain points for your prospect and their business. A personal touch may pay off later in the sales cycle, but if you’re looking at their family’s vacation photos before you’ve even spoken, you’re probably on the wrong track. Social media puts everything at your fingertips: you can search a prospect’s name and instantly have access to photos, articles, work histories, and so much more. Yet that quick search can lead sales reps to feel that they know their prospects better than they actually do. Warm interactions are critical in sales, but only if they come across as genuine. When it comes to social selling—the practice of finding, engaging, and connecting with prospects via social media—it’s important to be patient in developing a relationship with each prospect. Early messages should be professional, avoiding overly personal references and in-jokes. Later on, you may develop a rapport that makes conversation flow more naturally, but don’t be alarmed if that doesn’t happen with every prospect. Social selling is fruitful partly because it encourages less formal interactions that can feel more like friendships than professional networking. However, as a salesperson, your job is to keep the conversation focused on how you can add value and solve problems for your prospects. If you fail to do that, you won’t just waste your own time—you’ll eventually lose the prospect’s interest, too. Fortunately, there’s a simple way to avoid that pitfall: never reach out to prospects without bringing the conversation back to the value you can bring them. You shouldn’t be messaging your prospects solely to check in or see how they’re doing. Even if you’re only planning to touch base, include a relevant article or a new insight with each and every message. 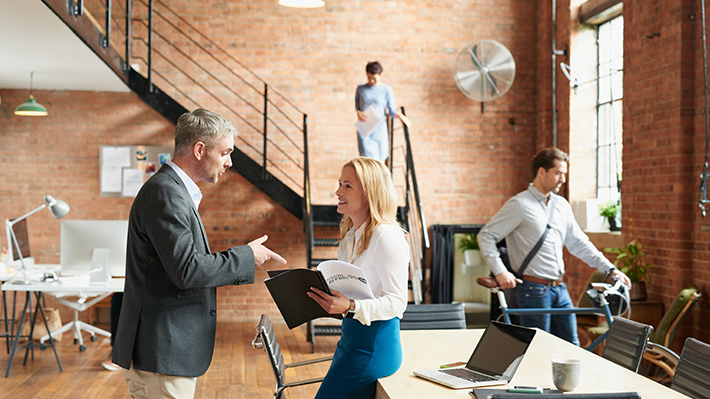 Because relationships are the foundation of sales, reps are always seeking ways to make their interactions more human—and social selling can help tremendously in that area. Still, salespeople must learn to navigate the specific etiquette of online interactions. Often, that means taking a step back and remembering to always be professional, patient, and valuable to the customer. To learn more about building relationships via social selling, download Hanging On By A Thread: How Uncertainty Can Be An Opportunity For Growth today.